The position of the PCD grade in the diagram makes it possible to determine the application range on the basis of cutting speed (CS) and the percentage of silicon (Si) in aluminum alloys, the combination of natural chemical elements that have the greatest influence on cutting parameters. 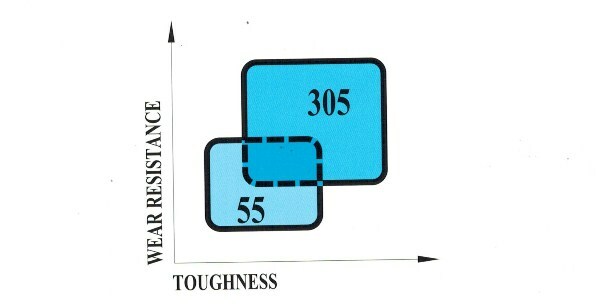 The diagram shows two areas for the position of two different PCD grades as a function of their wear resistance and toughness. 55 The size of the synthetic diamond grains and the powder concentration make this grade particularly resistant to wear. As the cutting material is extremely hard, grade PCD55 is suitable for continuous cutting applications in finishing operations. Use at high cutting speeds and feed rates appropriate for the cutting edge profile makes it possible to achieve an excellent surface finish. 305 The excellent tradeoff between synthetic diamond grain size and the proprieties of the binder results in a PCD grade with good wear resistance and toughness.